My bottom is sore and my thighs ache…. but I’m happy. One of the potential perks I got excited about when we decided to move down to Eastbourne from urban London two years ago was the chance to go horse riding on the South Downs. But shortly after arriving at our new seaside home, I fell pregnant, and while I was delighted to be having our second child it kind of scuppered my hacking plans. Life with a new baby daughter, a young son and a guesthouse then conspired to keep me very busy and before I knew it, Alexa was 16 months old and I still hadn’t sat on a saddle. Yesterday that all changed when Carl, the kids and I headed to a riding centre in the beautiful village of Alfriston – around 20 minutes drive from Eastbourne and well worth a visit. 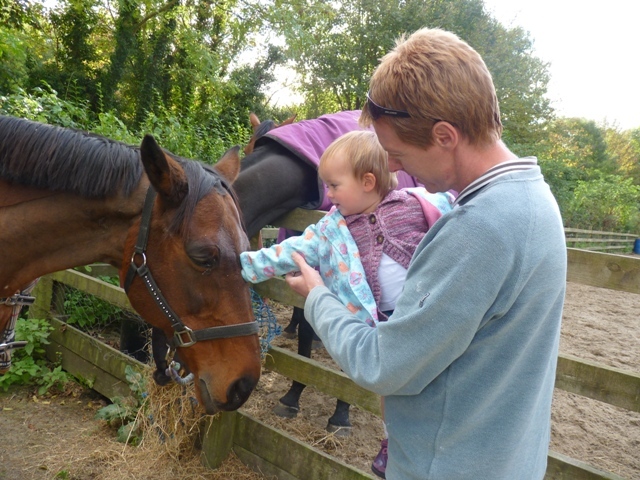 After Alexa got acquainted with some of the horses (and dogs and cats) on the farm, Carl took the kids off for a cream tea while I got to grips with Daisy – a lovely 6-year-old mare who is arguably the best-natured mount I’ve ever ridden. The scenery around is spectacular, so whether you want to simply have a plod around, or like me, to step up a gear to a canter, you’re guaranteed to enjoy your surroundings. Unfortunately I can’t guarantee your bottom will thank you the next day. So, something else to put onto your ‘Things to do in Eastbourne’ list. Call us here at The Guesthouse East on 01323 722774 and we can help arrange horse-riding. And indeed the massage to help you recover.